Joshua Brown studies violin with Almita and Roland Vamos at the Music Institute of Chicago’s (MIC) Academy, an elite training program for advanced pre-college musicians. Last year Joshua was a Rachel Barton Pine scholarship winner, and this year he has received the 2015/2016 Alexandra C. and John D. Nichols Laureate Fellowship. This past summer, Joshua was awarded both Second Place and the Audience Award in the 2015 Cooper International Violin Competition in Ohio. He had the distinct honor of playing the Shostakovich Violin Concerto with the Cleveland Orchestra, under the baton of Jahja Ling. “Had he played from behind a curtain, you wouldn’t have believed that Joshua Brown…was only 15,” wrote Daniel Hathaway for clevelandclassical.com. “His interpretation of Dmitri Shostakovich’s first violin concerto was so maturely wrought that it might have come from a seasoned professional. Brilliantly played and expertly paced, Brown’s performance checked into every emotional corner of [the] work … Brown was spellbinding throughout his entire time on stage.” Mark Satola in The Plain Dealer described Brown’s performance as “stunning” and "on an Olympian level…Brown played with such assurance that it was easy to forget he was a young teenager.” Joshua has won First Place in many competitions, including the MIC Young Artist Concerto Competition, the Luminarts Cultural Foundation's High School Classical Music Competition, the Sejong Music Competition, the Asian American International Music Competition, the Alexander and Buono International String Competition, the Music Festival in Honor of Confucius Competition, the DePaul Concerto Festival for Young Performers, the Robert Stanger Young Artist Competition, and the Rockville Competition. He was also recently named a 2016 National YoungArts Winner. Most recently, Joshua received many awards in the 2015 IX International Tchaikovsky Competition for Young Musicians held in Novosibirsk, Russia, taking home the Audience Award, Honorable Mention, the Academy of Arts Golden Medal, and the Siberian Academy of Arts Talent Award. He also had the honor of performing in the First Prize Winners Gala Concert and being formally invited to perform with the Novosibirsk Symphony Orchestra during its 2016-17 season. Joshua has performed at the Kennedy Center in Washington DC, Carnegie Hall in New York City, Severence Hall in Cleveland, Ohio, and Arnold Katz State Concert Hall in Novosibirsk, Russia. In addition to performing with the Cleveland Orchestra, he has also soloed with the Oistrach Symphony Orchestra, the Ars Viva Symphony Orchestra, the Northbrook Symphony Orchestra, the New North Shore Chamber Orchestra, the Elmhurst Symphony Orchestra and the Waukegan Symphony Orchestra. He has made solo appearances on WFMT’s Introductions and on NPR’s nationally syndicated program From the Top. In addition to his solo work, Joshua enjoys playing music with his brother and sister, and the three siblings have been featured playing their violins on both Fox News and WFMT. 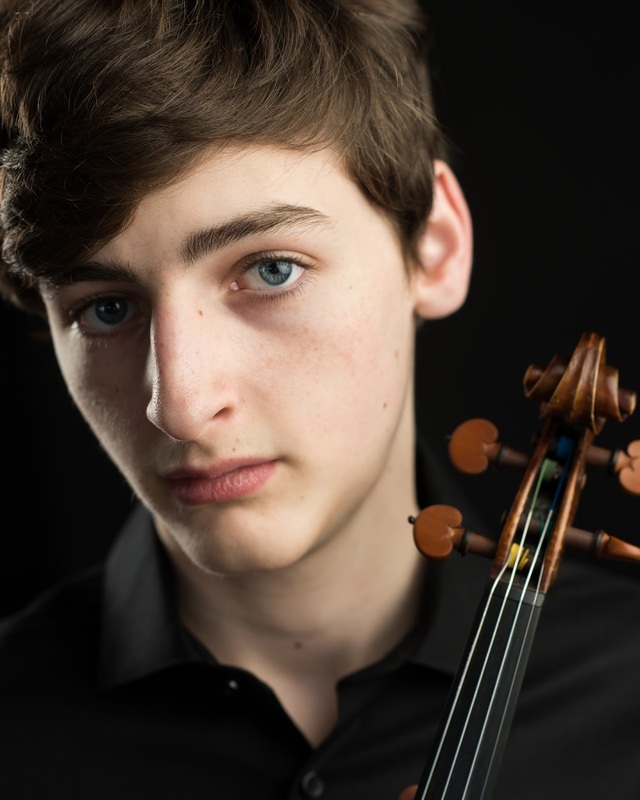 Joshua has had the privilege of taking lessons and master classes with teachers such as Pinchas Zukerman, Rachel Barton Pine, Ilya Kaler, Shirley Givens, Jonathan Carney, Jody Gatwood, Igor Yuzefovich, Kelly Hall-Tompkins, Lambert Orkis, Weit Hertenstein, Nurit Pacht, and Daniel Phillips. He plays on a 1910 Vincenzo Postiglione violin, generously on loan to him by the Virtu Foundation. Absolutely amazing performance! He is not playing the violin, he is talking to the audience! Congratulations. Excellent playing and fabulous performance. The Waxman was very imaginative, personal with excellent technique and sound! You have a musical approach and personal style which is great! You have a great sense of style between your various pieces. Bravo!